BTNEP support conservation measures that maximizes available natural habitats that maintain healthy populations of migratory and resident birds across the Barataria-Terrebonne system. 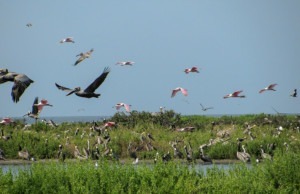 There are over 400 species of birds that are known to occur in the Barataria-Terrebonne basins. The various habitats contained within the Barataria-Terrebonne estuary provide vital resources for millions of birds. The three main reasons for the abundance and great variety of bird species in the estuary are – habitat, geography, and productivity. Many bird species found here are Nearctic-Neotropical migrants. The location of this region along the central gulf coast provides an ideal “jumping off point” for many migrants crossing the gulf on their way south during fall migration and convenient “ returning point” for those returning the following spring. In addition, many temperate migrants in search of milder winter climates forage in the estuaries rich productive habitats during the colder months. The sheer numbers of birds found throughout this region are partly due to the high productivity of the many wetland habitat types that occur here. Generally, estuarine wetlands are considered to be among the more biologically productive areas in earth. BTNEP aims to build a framework in the Barataria Terrebonne Basins for the conservation of bird populations that use the area. 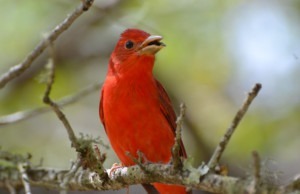 This framework will include components to educate the public about bird issues, monitor bird populations, and encourage private, corporate, and government landowners to protect critical areas and manage land under their care in such a way as to maximize its suitability as habitat for migratory and resident birds. Furthermore, this framework promotes avian tourism and the infrastructure to support public access.